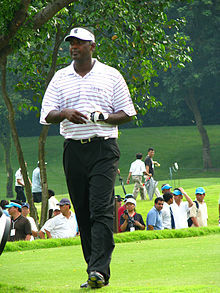 Vijay Singh, CF (Hindi: à¤µà¤¿à¤œà¤¯ à¤¸à¤¿à¤‚à¤¹), IPA: [ËˆÊ‹ÉªdÊ'É™j sÉªÌƒÉ¦]; born 22 February 1963), nicknamed "The Big Fijian", is an Indo-Fijian professional golfer who was Number 1 in the Official World Golf Ranking for 32 weeks in 2004 and 2005. Vijay was the 12th man to reach the world No. 1-ranking and was the only new world No. 1 in the 2000s decade.